The climate is hot and humid during summer months. Because of the proximity of the mountains, annual rainfall tends to be higher than in some parts of the country but it is still sporadic and concentrated mostly between November and April. The area is occasionally influenced by the fringe of the Indian Ocean monsoons in summer, which accounts for the extremely high humidity at times, when the upper hills are clothed in mist. Local water logging on clay silt soils is a problem but otherwise evaporation and runoff into the sea is rapid. Some parts of the coastline, mostly in the northern half, are rocky with small promontories and hills intersected by sandy beaches. Around Fujairah there are areas of semi-sabkha. The local water table is dropping because of excessive take-off for agriculture, but a lens of fresh water resists too much infiltration by seawater and enables date palm plantations to exist right down to the beaches. 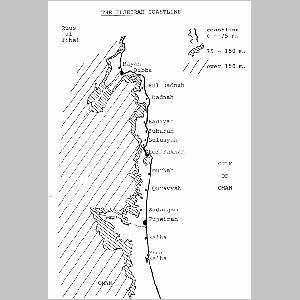 I have collected and recorded along this coastline on several occasions between 1982 and 1986. Major trips were conducted in April and November 1982, June and September 1983, July 1984, February 1985 and the same month in 1986. Most of these trips were in the valuable company of J.N.B.Brown, ex-Chairman of the ENHG (Abu Dhabi). The unsampled period between mid-April and mid-June may add further plant species to our lists. I am indebted to Mr. I.C.Hedge and his staff at the Herbarium of the Royal Botanic Garden, Edinburgh, for the vast majority of determinations. The following examines a few type-sites moving from south to north, with a checklist. Almost on the border with Oman, Khor Kalba contains a large marshy area of lagoons and mature mangroves (Avicennia marina), sheltering a variety of resident and migrant birds, including an endemic sub-species of white-collared kingfisher. Small clumps of sea lavender Limonium axillare, suaeda aegyptiaca and Atriplex leucoclada are the main plant components of the higher banks fringing these tidal lagoons. This area is becoming increasingly degraded because of the activities of picnickers, joy riders and everyday exposure to a fast-growing local population from Kalba new town. Among the mangroves only the halophyte Arthrocnemum macrostachyum can tolerate the tidal salinity. The area to the north of the mangroves is now becoming extremely degraded; some of the channels have been in filled or blocked and the trapped mangroves are rapidly dying off. An early colonizer of these in filled areas is Heliotropium kotschyi, which is also a well-established species along the road sided in Kalba old town. Above the tidal limits of the main tidal channel flowing past the fishing harbor of Khor Kalba, Polycarpea spicata and Spergularia bocconii, both of the pink family, have been recorded in numbers among shell debris on what is virtually a pebbly beach. Dried out specimens of Polycarpea remain stiff and brown long after fruiting. 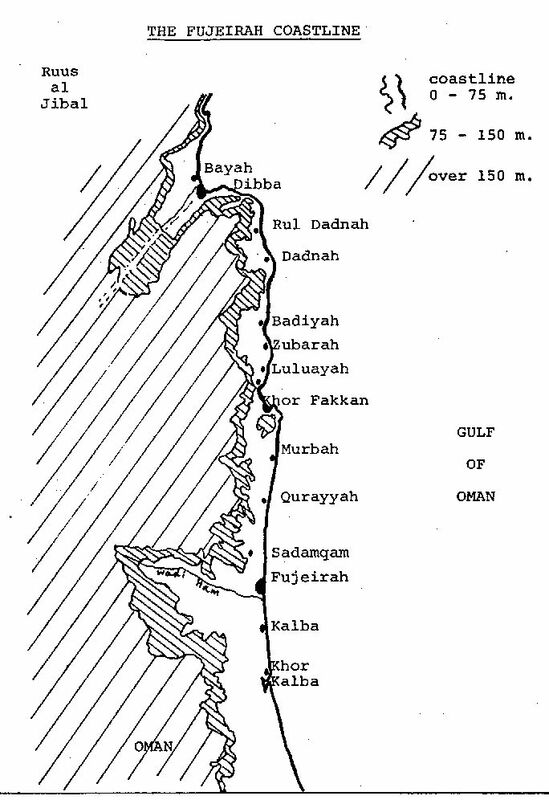 On one roundabout, next to Khor Kalba power station, and unusually large number of species was present on one trip, 23/11/82. Subsequently, and for reasons unknown, this little site has been almost barren ever since. The roundabout is about 15 meters in diameter and saucer-shaped with the central depression about ½ meter below the road curb and hence and ideal mini-reservoir for rainfall. Larger shrubs included Suaeda vermiculata, Salsola (schweinfurthii?) Suaeda poss. aegyptiaca and A. leucoclada. Smaller species included Corchorus depressus in flower and fruit and the Group's only recording to date of Tribulus arvispinus, also in flower. These were the smallest Tribulus flowers we had recorded. Emex spinosus and at least two Launea spp. were also present. Kalba oasis is an extensive area, parts of which are in very evident decline. It would appear that a combination of falling water table and increasing salinity has contributed, though several adjoining gardens are thriving. The decline may be a result of population movement and abandonment of some properties. The areas of neglect are interesting because some weeds are colonizing successfully where normally they are rigorously eradicated. Two such species are Convolvulus arvensis and Frankenia pulverulenta, the latter an indicator of salinity. In the vicinity of Fujairah port there is a wide tract of marshland dominated by a mature exclusive community of A. macrostachum and L. axillare, with occasional tufts of Scirpus sp. Surprisingly, Halopeplist perfoliata is not present here, thought it occurs farther up the coast. The coastal road north of the city is rich in plant species along its verges. Cassia italica, with its showy yellow flowers and distinctive curved pods; the lilac and white veined flowers of the prickly shrub let Blepharis ciliaris; the thin waving twigs of the bus-like Ochradenus auvheri; squat, sometimes semi-prostrate Fagonia bruguieri shrubs with prickles and small lilac flowers; and huge clumps of Chrozophora oblongifolia in the larger roadside depressions, with their 3-celled knobbly green fruit and powdery leaves. The region is full of different niches, from steep hills and rocky overhangs to mud and sand beaches, gravel areas and silty depressions. There are extensive areas of Acacia tortilis, Ziziphus spina-christi and Prosopis spicigera, some long-neglected; in the openings created by fallen trees are clumps of Taverniera spartaea, Crotolaria aegyptiaca and Pulicaria glutinosa, with respectively lilac, bright yellow, and darker orange flowers noticeable in spring months. The presence of this last species is an indication that despite the proximity of the sea, the mountains are just alongside too. This is also confirmed by the ubiquitous presence along the roadside of Tephrosia apollinea. Small thickets of Aloe sp. are a probable reminder of former graveyards, now overgrown. Although some date gardens are in good condition, and well tended, others are in an advanced state of decay, particularly some just to the landward side of the relatively new road and from runoff cannot reach the sea. This seems to have caused excessive salination of the soil, as evidenced by creeping colonies of L. axillare and S. vermiculata. Areas which are most degraded, but not over-salinated, are colonized by Cornulaca monacantha (though on nothing like the scale along the Arabian Gulf coast north of Sharjah) and Cyperus conglomeratus. It is perhaps surprising that there are also stretches of Rhazya stricta, which is more usually associated with the flat aridity of inland gravel plains, particularly around Al Ain. Along the Fujairah coastline, this species is most noticeable as far north as Murbah, after which it does not seem to be represented. Where almost permanent saline pools exist, on both sides of the road, the creeping grass Aeluropus massauensis sometimes forms extensive mats. Occasional patches of the tiny Aizoon canariense are much more prominent in some years than in others. Calotropis procera is rare and poorly developed in this region, mostly in thin stunted bush rather than the more usual tree form. At Khor Fakkan the mountains literally meet the sea. There are one or two inlets, small promontories and sea cliffs, plus bay areas of flat land, spreading oases and farms. Just north of the town is a small island linked to the mainland by a crumbling causeway. This island is rich in very tall specimens of Abutilon panosum with its large yellow flowers and circular seed groupings; and Haplophyllum tuberculatum, the only representative of the family Rutaceae in the region, which in spring literally covers the summit slopes with fragrant yellow flowers. Just to the south of the mainland end of the causeway a conical hill rises to about 100 meters, which drops into the sea as a cliff and jumbled rocks. This hill is home to a large number of plants. There are a few low A. tortilis trees to 2 meters high but otherwise most vegetation is lower and dense. A. panosum and physorrhynchus chamaerapistrum are noticeable towards the summit, the latter in some years with long straggling branches covered with eye-catching cruciform lilac petals. Dotted all over among the tough grasses and rocky outcrops are Pergularia tomentosa, Lavandula subnuda, Indigofera caerulea, Hibiscus cf. micranthus, G. erythraea, Pulicaria edmondsonii and Teucrium stocksianum. The major grass in this community would appear to be Cymbopogon parkeri but the family Graminae has not been well studied here. In a good April or May the seaward slopes are a mass of the mauve blooms of Taverniera aegyptiaca. Salvia macilenta, with its delicate hairy stems and fragrant lilac flowers, the stiffly spinescent forms of Convolvulus virgatus, often full of pupating caterpillars and the tough green stems of Euphorbia larica, an ever-present component of the UAE’s uplands, are all common on this particular hill. On the fringes of the local oases Convolvulus prostratus has been recorded climbing 3.5 meters into a Z. spina-christi tree (June 1983). In April 1982 Cucumis prophetarum in flower and fruit was found on beach rocks in the just to the bay north of the Holiday Inn and less than I meter above high tide level. But one of the grandest sights of this rocky coastline is that of huge spreading shrubs of Ochradenus baccatus in yellow bloom in March, April or May. Against the deep blue of the sea the flowers appear too bright to be real. Gaillonia aucheri is an important component of the hillsides inland of the road but occasional single plants or small clumps are found on the plain too. Forsskaolea tenacissmus, in appearance rather like a robust stinging nettle, the young plants with reddish stems, is sometimes found in damp rocky niches but is rare compared to its preferred habitat beside mountain wadis. In some springs and early summers patches of the annual Zygophllum simplex, with myriads of sparkling yellow florets, dot the waste ground beside the road but perennial Z. species are limited to the occasional Z. hamiense. Here the main road becomes hemmed in between the hills and the sea in parts. The commoner hillside components (E.larica, G. aucheri, L. subnuda, P. glutinosa, P. Chamaerapistrum and C. parkeri, to name a few) are all in evidence but the dominant shrub along the road is T. apollinea that has formed extensive colonies. Cleome rupicola and C. dolichostyla are fairly common roadside species in spring. The caper Caparis cartilaginea is occasional, one notable example being at Dadnah overhanging a large rock right on the beach, facing the ocean. C. spinosa has not been recorded along this coastline though it is the commoner of the two species further north in the southern Ruus al Jibal. There is much Acacia scrub along this stretch and evidence of many abandoned stone hamlets. As one approaches Dibba the higher hills to the left display the odd Moringa peregrina tree but nothing like the dense stand in the Wadi Khabb Shamsi north of the town. The wasteland above the Dibba beach areas includes T. aegyptiaca and P. spicata but Otherwise is not noticeable apart from weeds typical of local open oasis and plantation habitats. The vast inland plain of wadi Dibba is notable for its forest of A. tortilis and one can be forgiven for thinking that one is in African savannah country. Three major plantation areas along this coastline have been reconnoitered over the years: Mazra’ Plantation in Kalba Oasis, Luluayah Plantation just north of Khor Fakkan, and Badiyah Oasis. Others have been checked cursorily from time to time but not for in-depth collecting and recording purposes. The date palm Palm Phoenix dactylifera is the major crop species but other important fruits include mango, mulberry, lime, guava, Assyrian plum (Cordia myxa) and Indian almond (this last also to provide shade). Other trees and shrubs which fringe these gardens seem to have been planted as much for ornamental purposes as any economic use. These include Lawsonia inermis (henna), Casesalpinia bonduc (fever nut), Plumeria acutifolia (frangipani), Melia azederach (neem), Albizzia lebbeck (parrot tree) and Jasminum sambac (Arabian jasmine). Within these gardens are open fields where such vegetables as radish (Raphanus sativus), sweet potato (Ipomoea batatas), aubergine, hot pepper, cabbage, cauliflower and salad crops are cultivated. Lucerne is grown as fodder. Irrigation is from one or more deep wells within the oasis and the rhythmic thump of the pump engine, as the water is drawn up and out into cement-lined and earth channels into the small fields, is often the loudest sound to be heard, sometimes the only noise above the rustle of wind in the trees and the calling of raucous house crows. Wherever the fringes of these oasis areas have been neglected, colonizing species have moved in to form sometimes impenetrable thickets. It is often quite impossible, as on the seaward side at Luluayah or at Badiyah, to reach some of the fringing ornamentals for the dense tangles of undergrowth, often over three meters high. Such opportunist species include Ephedra foliata that forms huge canopies on some trees, completely clothing them and gradually dragging down some of the outer branches. Another conspicuous invader is Indigofera oblongifolia, particularly rampant at Mazra' and Luluayah, with shrubs up to 2 meters high and 3.5 meters across. A. panosum also thrives in these fringe areas. The fields in these plantations are full of weeds, especially beside pathways and irrigation channels, and even within the cultivated furrows. Some of the lager plants are pulled up from time to time but in general these weeds do not appear to pose a significant threat to the cultivated crop. The combination of fairly good soil, water, shade and fertilizers results in growing conditions whereby all species can proliferate in season, and the effort required to eradicate all weeds would not be worth it given the size of the enclosed plots and the impossibility of using machinery on a large scale. Beneath the shade of the palms Melilotus indica, Bacopa monnieri, F. pulverulenta, Euphorbia indica and Vernonia cinerea are all extremely common. The tall grass Demostachya bipinnata is frequently noticed around the base of the trees and may be utilized for fodder. Boerhavia diffusa and the related Commicarpus (helenae?) are found mostly in shade though the latter has also been recorded as a prostrate straggler on open sand on the seaward side of Luluayah (February 1986). In more open habitats, for example in fallow fields, weeds have the opportunity to proliferate and they are usually left undisturbed. Here Chenopodium album, C. murale, E. spinosa, Ammi majus, Corchorus trilocularis, Solanum coagulens and Dianthus cyri are all likely to be found in February. Arilstolochia bracteata, with its bell-like curved brownish flowers had only been recorded at Luluayah (Feb. 1986). The foregoing account describes only some of the more obvious species likely to be encountered along this coastline and does not do justice to the wealth and variety of species. In the plantations especially it is not always possible to refer to individual species as annuals or perennials as the particular conditions under which they grow negate purely seasonal or climatic patterns. To take one example, Abutilon panosum has been recorded in flower somewhere along this coastline on every major visit, regardless of time year. The following checklist is complete for definite recordings of the ENHG (Abu Dhabi) but further reconnaissance is expected to add to the list.